The November Roadmap: Good Stuff Ahead! 3G Mifi Internet – Almost Here! This announcement is causing the most excitement here at the TOAST.net offices. 3G MiFi service is just about ready to go, and testing has gone very well. For those not-in-the-know, 3G MiFi is a wireless Internet connection that gives you access nearly anywhere from a device the size of a credit card. You turn the device on, it makes a wireless connection with up to 5 laptops, tablets, smartphones, or or any other WiFi enabled device. The service itself will be relatively inexpensive, there’s no cables or wires to connect to your computer, and no software to install: just press a button and it works! Look for an official release announcement in the next week or so. Keep an eye on this page for updates. A lot of businesses run run their own email systems, but things like server failures, loss off connectivity, or spam attacks can disrupt email services in an instant. TOAST.net’s new Mail Protection prevents message loss during an outage and prevents spam and viruses from reaching the server. What I like about this service is it adds a LOT of high end features for only a few cents per user. Things like spam filtering, daily quarantine reports, and even an emergency web portal that lets user check mail if things go down would cost big bucks to install locally and support. This product should help out a lot of overworked IT people out there. Everyone wants a website, but a lot of people have a phobia about creating one. Reasons like “I don’t know what I’m doing,” “it’s probably too expensive,” or “I don’t have anyone to help me with it” are commonly given. Well, these reasons are now MOOT! We’re introducing Web Presence Builder, and there has never been an easier way to get your own website going. If you can create an email, you can make a webpage. The process involves logging into a web app, typing content and uploading photos using a simple interface, and clicking a button to post it to the Internet. At less than $10/month, I’m hoping Web Presence Builder will get small businesses and organizations the Internet face-time they deserve. A lot of our business customers are using the SmarterMail email system, and we’ve made a couple of great changes. First, we’ve made the spam filtering feature better than ever! Messages will now be more accurately filtered, and you can teach the system which messages are spam and which are not by marking them “Spam” or “Not Spam”. 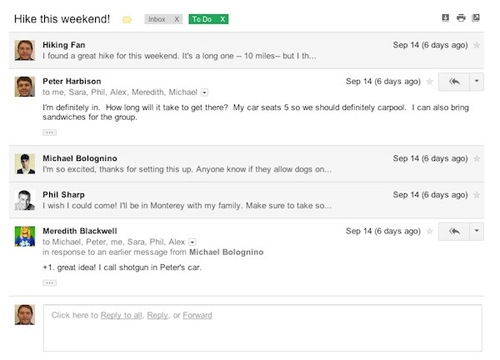 Email responses will now be grouped together like a chat window. Profile pictures from your Contacts list will mark each response, making it easy to follow an email conversation. Feel your email is too spaced-out? (in a size way, not a “this person is crazy” way). You will now be able to make adjustments to your taste. New Themes, better search, and improved navigation round out this update. This is only a taste of the incredible things we have coming up. Let us know what you think and stay tuned! Hi. I”m really thrilled that toast is going to have a wireless connection. I’ve used toast for a number of years & have been quite pleased. However, when I moved to a rural area in NC, I couldn’t get DSL. I don’t even have a home phone here, just use my cell phone. Unfortunately the only wireless carrier that gets reliable service up here on my hill is Verizon. I’m don’t like using verizon for any number of reasons. And now I see that the wireless carrier for toast is going to be T-Mobile… crap! I still won’t be able to use it. I love where I live, but there are some major disadvantages. Rececca, we experimented with a TMobile provider previously, but weren’t happy with the results. Our new carrier will provide much better service, and the MiFi card used to connect is far superior. Keep a look out for the official announcement! So… who is the new carrier going to be? Can’t wait…been waiting. What’s the cost going to be?? Hope it’s reasonable, I’m a senior citizen on S.S. Looking forward to see what’s next.